10 pp. Roman, 228 pp. Hausa is the numerically most important member of the Chadic language family and is spoken by over 35 million people. It is the mayor language of northern Nigeria and southern Niger, nowadays the language of sedentary people. In contrast to that Tuareg, a Berber language, is mostly a nomad’s language. Linguistic contacts between Tuareg and Hausa have not remained unnoticed by previous scholars. The great event in Hausa-Berber studies occurred in the late 1960s and early 1970s, when the Hausaist Claude Gouffé wrote a number of articles concerning Tuareg-Hausa interferences. After Gouffé’s study, the most important contributions to the question of Tuareg loanwords in Hausa were made by Neil Skinner, which culminated in his Hausa Comparative Dictionary (1996). The present study follows the general lines set out by Gouffé and, to the lesser degree, Skinner. Its core part, chapter III.1, is an analytical list of about one hundred items which are considered certain Tuareg loans in Hausa. This list contains many etymologies already proposed by Gouffé and Skinner, but half of it are new proposals. In chapter III.2, some 50 uncertain etymologies are discussed. Some groups of etyma, which have specific histories, are studied in a separate chapter (chapter II). This comprises a study of words for domestic animals, which is mainly concerned with the evaluation of proposals by Skinner (1977, 1981), a study of early Islamic loans, a study of Berber loans which entered Hausa through Kanuri, and a special section on the etymon “camel”. Chapter IV provides an analysis of the ways Tuareg loanwords were integrated to Hausa phonology and morphology. 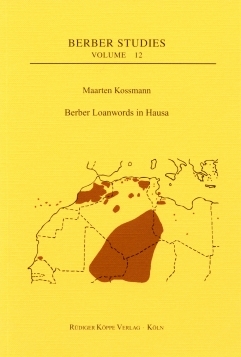 In chapter V, a number of subjects pertaining to Hausa linguistics are treated, which are drawn from the study of Tuareg loanwords, but which go beyond the analysis of loanwords only. [...] the study is an impressive contribution in the domain of language contact in Africa. If not all etymologies could be commonly accepted, they would certainly give rise to further discussion and research. [...] the analyzed material brings maximum of information and shows how fruitful the study of this type can be for both Berber and Hausa, plus other languages of the region between the middle stream of the river of Niger and the Lake of Chad.